Got a new one coming out. My first unit to use the 510 atty system (actually it is a m7x.5 metric thread). It is tiny, 1.5" long x 1" diameter. 14 mm stem, using our standard stem design, perfect for micro dosing 50 - 125 mg. The female joint is made of maple similar to the Essence. Here is the unusual part, the coil deck is made of maple! 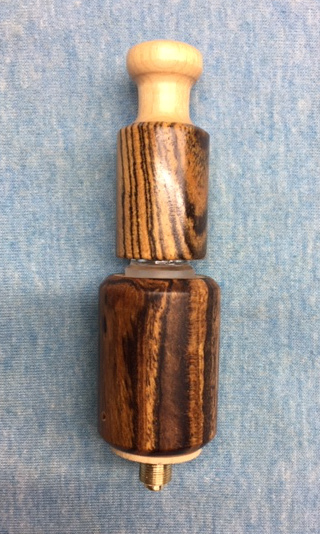 There are brass connectors attached to the wood (I am looking at plating those with silver). Making the deck frees me from China but means I have to make some tiny brass pieces. Performance has been great, I've been using mine as my daily driver. The stem in this pic is our new cooling stem. Currently I'm not using a screen and it has been fine. A screen can be added. This is where it gets interesting, I made the deck out of maple and fitted it with brass connectors that go to the 510 system. 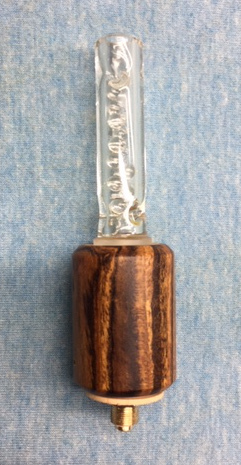 And here is the fancy stem, a short stem with cooling beads and a fancy bocote cover. There will be a few betas in the web store today at $65 then I expect to start selling them at around $85. dynospec, ataxian, JCat and 16 others like this. Is there some kind of internal sleeving to isolate the heater element from the wood? A glass tube like the Splinter? Or a SS foil like in new versions of the iHeat? How are the parts held together? Did you manage to do it without using adhesives? Did you manage to make it work in TC mode on your box? ataxian, bossman, VaporWare and 12 others like this. The brass will be plated in production units (betas will be silver plated, eventually I'd like to gold plate them). That should take care of oxidation issues. All brass will be lead free. Center pin is not adjustable. The length I'll have to work out, currently it is set up for the evic vtwo mini. The brass male part has a ceramic tube that insulates the center pin from the brass male tube. The brass tube threads into the brass connector on the deck to hold it in, there is an external jam nut that locks it together. The central bolt goes through the ceramic tube and threads into the other brass connector. There is an external peek washer the locks the connector in place. I am using arctic fox in vw mode. I loaded tubo firmware but didn't get good results in TC but I'm not that familiar with TC settings. Being impatient I just went back to arctic fox. Hoping someone who knows TC can try it out. ataxian, Zangano Cruel, VaporWare and 13 others like this. Like the wood female and lack of glass. The wood base is interesting. How durable would this be? Guess this helps to keep the size down. As always mistvape makes class products, at a reasonable price. Although i wont jump on the beta, i will be watching this one carefully, i can see an imp in my life soon. ataxian, paytonpenn, TNT_error and 5 others like this. How is the cooling? Will it be possible to use one of your whips with it? ataxian, Copacetic, Vapeur Rogue and 2 others like this. ataxian, Zangano Cruel, The Beagle and 2 others like this. I'm pretty sure I got the whips from you for the mvt. They have a screen on one end and a mp on the other and fit the mvt perfectly. Not for water. Does the imp use the same size mp? The mvt's is smaller than most of my other vapes. ataxian, mistvaporizer, Copacetic and 1 other person like this. ataxian, Copacetic and Vapeur Rogue like this. Looks cool ! I've been using a similar stem lately with my halo-mesh,but it is 19mm male filled with 8mm quartz terp pearls i got for cheap on dhgate ).I think i prefer this compared to the dimples,because it is easy to clean. Is there anyway to get out the beads in your stem ?Are they moving freely or are fused ? ataxian, Vapeur Rogue, mistvaporizer and 1 other person like this. The beads move but can't be removed. After a few uses the oils stick them together. ataxian, Azn2101, Zangano Cruel and 1 other person like this. I am very tempted to jump on this. Is it the same heater as the touch? Will it be user service/repairable (with guidance of course) to save international posting if something needs tweaking on these betas? Looks like it all comes apart fairly easy. Aliexpress has evic mini for 29us dollars so would work out pretty reasonable to finally test the mod waters. Do they all look that great? ataxian, Vapeur Rogue, Copacetic and 2 others like this. The stems it will use are 14mm and I always found the MistVape to be more efficient than the Iheat or Milaana especially if you don't stir, I think the thinner 14mm bowl is the reason imo. Like @KeroZen I'm looking forward the TC feature too, we'll dig on that topic! The stem idea is pretty interesting even if I like to be able to scrape the reclaim out or to brush into while cleaning. ataxian, chimpybits, Vapenvy and 3 others like this. 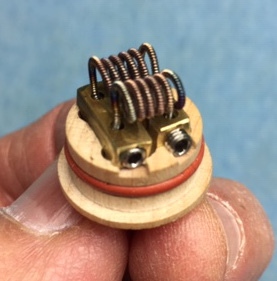 You can change coils if you like so yes it is user serviceable. ataxian, Zangano Cruel, Vapenvy and 3 others like this. ataxian, StormyPinkness, mistvaporizer and 1 other person like this. What is the exact dimensions in mm? This is important to know if this vape will fit in a side by side mod such as a witcher. ataxian, KeroZen and mistvaporizer like this. I'm thinking of getting this when it is a bit more evolved even though it will be more expensive. I wish someone would post somewhere info on how to use box mods for vapes. Like what is TC mode and why would I want it. And how to set it. I just go a box mod for a future iheat but I have no idea what to do with it. I asked in the ask thread but no response. How have those of you who understand box mods learned to make sense of them? The unit is 25.4 mm in diameter and 38 mm long. 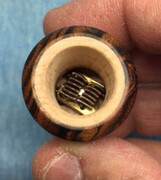 The threaded connector is standard 510 atty (which is actually M7x.5 metric thread). TC stands for temperature control and VW is variable wattage. The mods measure the resistance of the coil and bases temp control on that. The resistance changes with temp so there is a formula the mod uses to control the temp based on coil resistance changes. I loaded arctic fox firmware on my mod and use VW with the setting about 16 watts. Tubo firmware has a more refined TC setting but I only looked at it briefly and am not using that. @antispleen is getting a beta and hopefully he can see if TC works with the Imp. You can get arctic fox here https://nfeteam.org/ it is pretty easy to load. Let me know your other questions, it starts to make a lot more sense once you work with it. ataxian, Summer, The Beagle and 3 others like this. ataxian, Vapenvy, KeroZen and 2 others like this. ataxian, abracadaver, paytonpenn and 7 others like this. Technically speaking, @Pipes did it first with the Project "Pure SF" version. But the Imp will be the first commercial product indeed. The unit is 25.4 mm in diameter and 38 mm long. The witcher mod has a maximum atty diameter of 25mm. I would assume the imp is slightly too big which is a big shame. Would be good if a beta tester could see if it fits. This was one of the iheats big selling points. The iheat in a witcher is really really small, until you hold it in your hand you dont know how dinky it is. Probably just slightly smaller than mistvapetouch 1. Unfortunatley my iheat did not work in TC on the witcher. Could have been the mesh heater. Others complained of this too. Now a IMP might just work in TC seeing it uses standard ecig coils. That would be very cool. @mistvaporizer can the imps diameter get any smaller? Just 0.4mm? Edit: in fact the imp is quite a bit shorter than iheat so would be even small.on the witcher. ataxian and KeroZen like this. It is possible to make one a little smaller in diameter. I could take a mm or so off for you as a custom one, a few bucks more. Some of the beta group will test tc mode so if it works you will find out here. ataxian, Diggy Smalls, oddjobold and 1 other person like this. I like where this one is going a lot! ataxian, oddjobold, mistvaporizer and 1 other person like this. I agree with @oddjobold it might be better if the diameter is smaller. I have a Movkin Disguiser mod which will not accept any wider diameter than the Iheat.... although I have several others mod too! ataxian, KeroZen and oddjobold like this.